Sister came down for the weekend, for Mother’s day and because I was preaching on Sunday. After church on Sunday we went to see the Avengers and then had an early dinner at Persimmon. It was delicious. On Monday Marian and I made Mother’s Day brunch. We used to get up really early and make breakfast in bed for Mom before church, but since Sunday was so busy we postponed brunch until Monday. 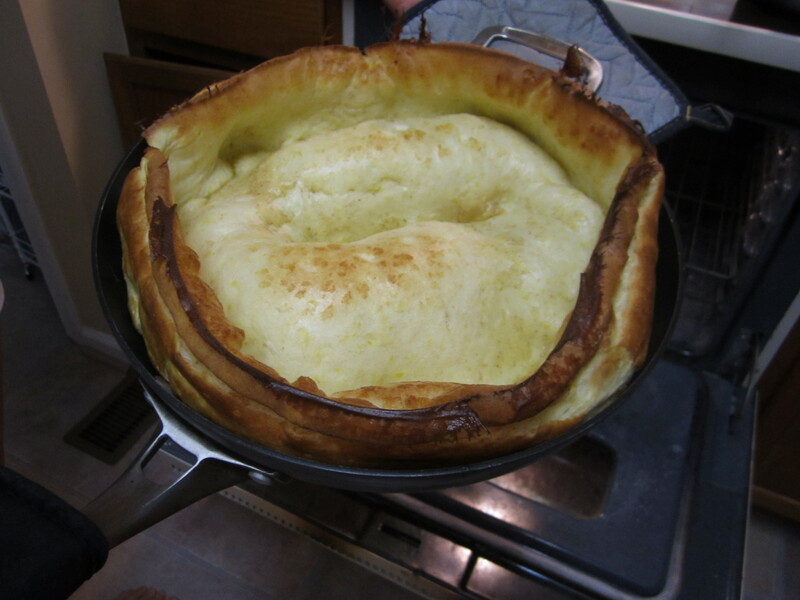 I recently found a recipe for a Dutch Baby. I’d always thought you had to have a cast iron skillet to make them, but this recipe said I could use any large skillet. Mom and Sister are big fans of Dutch Babies, and you just can’t beat the presentation! This turned out great! It was light and delicate, crispy and tender. Mmmm just talking about it makes me want another. It’s also quite simple to make. I think you could get this out on the table in 30 minutes. Make sure you have an audience when you pull it out of the oven! It’s quite the impressive sight and it sinks quickly (which is supposed to happen). I made a blueberry syrup to go with the Dutch Baby, but a little lemon and powder sugar is also delicious, or you can try it with Maple Syrup if you like something sweeter. We had quite the feast with Dutch Baby, fruit salad, asparagus and goat cheese omelets, and shrimp! A delicious way to celebrate our wonderful Mom! Preheat the oven to 450°F. Grease large skillet with cooking spray and place 1 Tbsp butter in the pan, set aside. In a large bowl, combine flour, cornstarch, lemon zest, and salt, whisk until well-mixed. In a separate bowl, whisk eggs until frothy and light, about 1 minute. Whisk milk, butter and vanilla into the eggs until incorporated. Place pan in the oven to warm. Whisk half the liquids into the dry ingredients until no lumps remain. Slowly whisk in the remaining wet ingredients until mixture is smooth. Pour batter into heated pan and bake until edges are deep golden brown and crisp, about 20 minutes. Serve right away with a little bit of lemon juice and a sprinkle of confectioner’s sugar.